In a futuristic era, a great war was fought where samurai on both sides mechanized themselves in order to become ultimate soldiers. With the end of the war, the merchants took over, leaving many samurai directionless; some have even resorted to banditry. One such group, the Nobuseri, now terrorize rural villages for their rice harvest and routinely destroy those who resist. The elder of Kana Village decides that the only way to rectify this is to hire samurai to protect the village. Since they can only offer rice for payment, the water priestess Kirara, her younger sister, and one village farmer head to the nearest city to recruit willing samurai. They endure many perils and failures as they gradually assemble a team headed by the war veteran Kanbei, but will these seven samurai be enough to defeat the tenacious Nobuseri and rescue the village women who have been kidnapped? And are the Nobuseri even the root of the real problem? The 2000s was a breeding ground for imaginative anime reinterpretations of classic works of film and literature, with major successes including 2001's Metropolis , 2004-2005's Gankutsuou: The Count of Monte Cristo , and 2007's Romeo X Juliet . 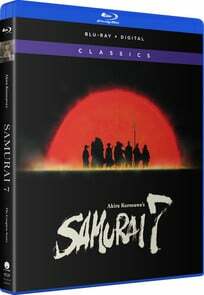 This version of Akira Kurosawa 's masterpiece Seven Samurai originally aired in 2004 and falls neatly into that company. It takes a similar approach to its peers by retaining characters and story elements from the original but heavily revamping their use, achieving a moderate level of success in doing so. The series' 26 episodes are broken into three main acts, all of which follow the course of events from the original movie to some degree, but also pad the story out with additional twists and world-building. The first act, which covers the first ten episodes, primarily takes place in the city of Kosankyo and involves assembling the samurai and traveling to Kana Village. The second act, which covers episodes 11-17, details the defense of Kana Village from the Nobuseri. The remaining nine episodes compose the third act, where the surviving samurai all converge toward completing their final objectives: rescuing the kidnapped women and dealing with the forces behind the bandits. While the third act is the most padded and broadly interpretive of the original movie's content, major events remain the same between versions, even if the key deaths happen under different circumstances. The fates of some villagers common to both versions are a little different, but the original movie's iconic final line is delivered verbatim. When viewed solely on its own merits, this series offers a classic tale of gathering a group of washed-up warriors for a noble cause and allowing them opportunities to be heroic again. The rewards are paltry – basically, they just get fed – but each of the seven has his own developed reasons for participating anyway. Some have something to prove, others seek redemption for past failures; some are looking for something interesting to do, and others participate because of loyalty to others who are involved. One even fights because he seeks to duel the leader Kanbei to the death once everything is done. Each of them also falls into a classic archetype: the grizzled veteran, the lieutenant, the entertainer, the fool, the brash youngster, the engineer, and the stone-faced combat expert. Of these, the character who gets the most complete development is young Katsushiro, who gradually evolves from an idealistic newcomer into a more embittered fighter as he loses his innocence. The machine-bodied Kikuchiyo also starts out as the obligatory idiot but gradually becomes more endearing as his merits shine through, getting the series' most heroic last stand. Of the others, Kyuzo is the least-developed or interesting, with little to nothing revealed about his background. Overall, the samurai make for a satisfyingly diverse ensemble. While the series is not purely action-driven, its grandiose action scenes nonetheless lie at the core of its appeal. Some of these sequences are truly spectacular and imaginative affairs, especially in the first act. Even from the earliest stages, there is a certain degree of implausibility and ridiculousness to these fights, as the series goes full-bore on the notion that a samurai's sword can cut through anything, but the silliness of the power creep starts to become evident in the later stages of the series, when the action sees samurai blocking energy cannon blasts, slicing through mecha -sized warriors, and other stupefying feats. Fully enjoying the action does require a higher level of suspension of disbelief than usual, though the resulting spectacle certainly helps. The addition of Kirara to the cast also adds some opportunities for potential romance, as she partly fills the role played by another village girl in the original movie while also going beyond it. However, that element is always more teased than fully realized. More involving is the rise to power of merchant's son Ukyo, who initially looks like a garden-variety fop but eventually proves to be much more dangerously cunning. The production effort comes courtesy of a GONZO team helmed by the late Toshifumi Takizawa , who was otherwise best-known for directing much of Dirty Pair . When the visuals are on their A-game, the series can be a feast for the eyes, with a wonderfully layered steampunk city in Kosankyo, distinctive vehicle and equipment designs, the mecha -like Nobuseri, and menacing ships that look straight out of a dark '80s sci fi movie. The variety of character designs is also remarkably broad, from robotic samurai like Kikuchiyo to a sensuous village girl outfit for Kirara. At its best, the animation is also vibrant and exciting, but the series does suffer greatly from artistic inconsistency. Characters sliding off-model isn't unusual, some crowd shots are repeated multiple times, and when the animation breaks down, it completely breaks down, resulting in one early episode that looks rough to the point of seeming unfinished. Use of CGI was good for the time but pretty iffy by current standards. All of this inconsistency continues throughout its run, despite the series leaning heavily on opening recaps and an extra-long eyecatch to shorten the need for new animation. The most consistent aspect of this production it its musical score. Kaoru Wada has a stellar anime career, with strong efforts on titles ranging from 3x3 Eyes and Ninja Scroll to Princess Tutu and the InuYasha franchise , and this effort certainly belongs on that list. He leans heavily on traditional Japanese instrumentation in both rousing action scenes and slower scenes to great effect; rarely has the tension produced by slowly-plucked strings sounded stronger in anime. Neither the two openers nor the two closers distinguish themselves as much, but this is still a series worthy of owning the soundtrack. Funimation 's re-release of the series is a bare-bones affair, with only clean theme songs and promo videos for extras; in other words, it lacks the commentaries included on Samurai 7 releases over the last decade. In an interesting move for Funimation , the release is Blu-Ray only, though access to a digital copy is included. It also retains the original English dub , which is a generally solid effort. The stand-out performances are Anthony Bowling 's rendition of Ukyo and Bob Carter 's take on the samurai Gorobei, but the cast is deep with familiar voices from the mid-2000s anime scene. Though some of its CGI may look dated, Samurai 7 generally holds up well for a title approaching two decades old. Being one of the earlier TV anime to be produced for high definition (and being among the most expensive anime series of its time) definitely helps. The story it tells is timeless, with emphasis on what it means to be a warrior or farmer in a time when the wars are over, and farmers have come to represent the soul of humanity instead. It may not ultimately be as prestigious as its source material, but Samurai 7 does its job well enough to be considered one of the most epic TV anime of the 2000s.